Good Morning, Friends! Please enjoy this, my First Peach Rose of the year in my Garden!! I hope you are all having a marvelous Friday! 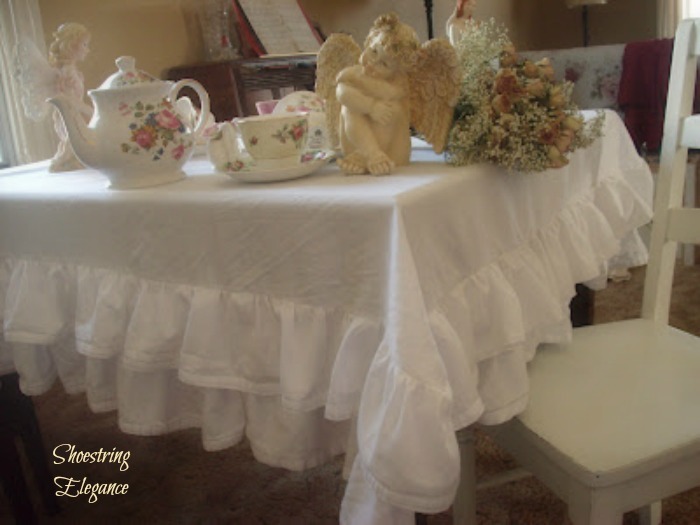 I am working on some of those lovely projects that I told you I would be sharing with you! Have a Glorious day and remember to take time to walk through your garden!! It's FREE and Oh So worth it!! There is beauty everywhere you look these days, you must remember, you do have to look...this is from a simple path though my Mom's garden. This is this morning in my garden!! You know, when you watch cooking show, how the cook always says they wish we had smellavision? I'd have to agree this morning. There is a very light drizzle over my garden, and this Jasmine permeates the air around.....Oh, how I wish I could bottle this smell!! Nothing will ever smell as good as those whiffs of Heaven that nature brings! 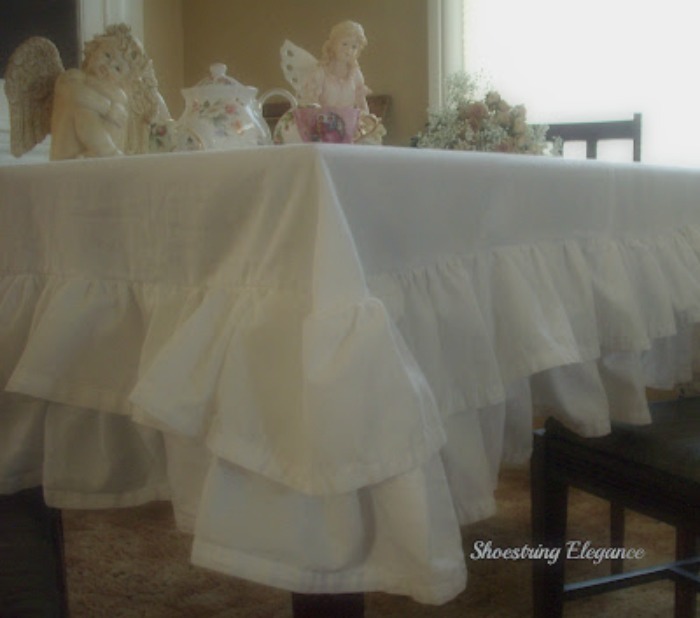 French Country Cottage Inspired Double Ruffled Tablecloth!! 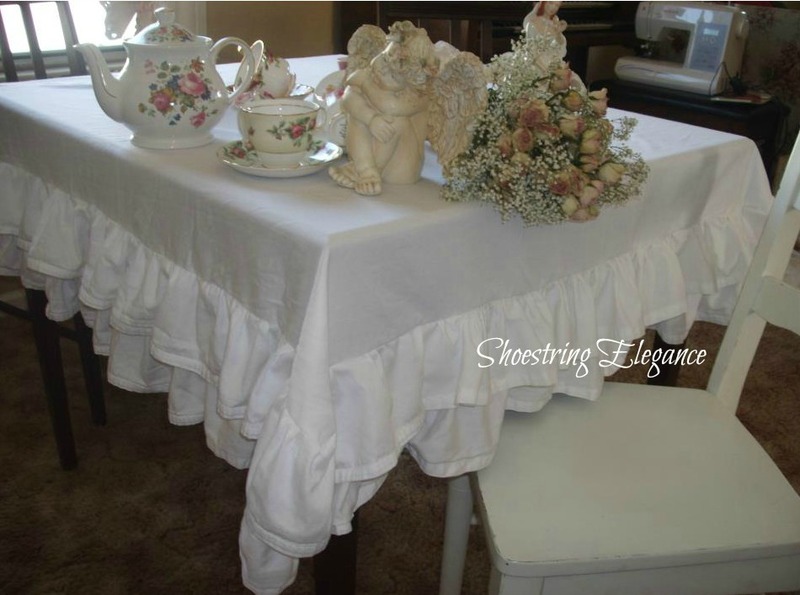 Believe it or not I made this Lovely Little Tablecloth with 2 white queen sized sheets, I got at The Goodwill. Total cost $6.00 plus some time!! and still have fabric leftover!! much less work for you and I!! I have to admit, I've been truly enjoying this, not to mention the other projects it has inspired.